With over 1 million high school football players in the U.S. it’s understandable that more players are using a football ankle brace to protect their ankles while participating. Protecting your ankle and providing additional support is advised to help prevent ankle injuries while playing football. We offer a wide selection of high-quality football ankle braces to protect players’ ankles from an ankle sprain or a fracture. If your position involves running or cutting then our football ankle brace products can help reduce the chance of suffering a serious ankle injury and help keep you in the game. Browse our football ankle brace selection or use our filters to find the right brace for the level of support needed for your sport. WHAT IS THE BEST ANKLE BRACE FOR FOOTBALL? Football is a high-impact sport. The amount of twisting, cutting, and running in football makes players susceptible to ankle injuries. Landing awkwardly from catching a pass or being involved in a pile-up at the line can result in frequent injuries that can keep players on the sidelines. So, it is a smart decision to get a good brace that can help protect your ankle without limiting your mobility. You should choose the best football ankle brace based on your activity and previous injury history. These ankle braces rely on the lace-up design to provide an exact fit and include velcro straps to support your ankle. These are typically the most comfortable to wear and offer a moderate level of protection for players. These braces having removable stays that are combined with the strapping system to provide a moderate to high level of protection. The stays can be removed if necessary but it is better to utilize them to support the ankle during lateral movement. The rigid shell design makes this the most recommend football ankle brace for maximum support and stability. If you have previously injured your ankle or have instability, then this ankle brace can help protect your ankle the best and keep you from reinjuring it in the future. 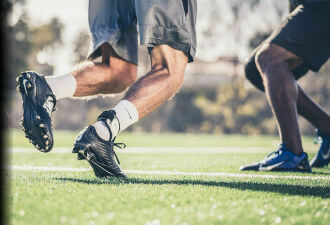 Choose your football ankle brace based on your activity level and your previous history of ankle injuries and you’ll wisely select the best football ankle brace for your condition. Shop ankle braces for ankle support and protection against injuries. Find the latest back brace products for lumbar support and pain relief. Top Names in Knee Braces, Ankle Braces, Back Braces & More!! DME-Direct.com offers today's most extensive brace selection for common orthopedic injuries to your knee, ankle, back or anywhere else on your body. You'll find braces and supports from today's leading brands, along with information, videos, and recommendations for locating the correct brace for many types of injuries. Huge selection of the Newest Brace Products at Great Prices! As the largest west coast distributor of orthopedic braces, we physically warehouse all of our inventory unlike other retail sites. We maintain all new stock - not discontinued designs, or braces with old foams, glues, or resins, let alone returns after surgery. This ensures greater performance, as well as, the highest level of patient protection for recovery following an orthopedic procedure. When you need a brace for an orthopedic knee, back, or ankle injury, DME-Direct is the place to go for braces with the latest designs and medical-grade materials for effective pain relief. Need some help finding the right brace for an injury? No worries! We provide professional support for physicians, hospitals, patients, athletes, and consumers in need of locating the right brace required for achieving a complete recovery. Shop, compare, research, and buy physician-recommended braces for everything from recovery after surgery to returning to athletic participation - and everything in between.